The Volkswagen Beetle is a car manufactured by the Volkswagen company. It was designed by Dr. Ferdinand Porsche. When it was introduced, it had gone through over a million miles of testing - more than any other car at the time. 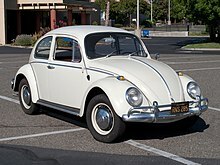 The history of the car is the history of the Volkswagen company - the company was created to make that car. Other than some military vehicles during WWII, it was the only car the company made at first. The car was made from 1949 to 2003, over 23 million of them. For many years, it held the record as the most-sold car ever. It took the record from the Model T Ford in 1971, and held it until 2000 when the Toyota Corolla took it away. The basic shape and design of the car did not change. It was also powered by an engine in the rear, had a small trunk up front, and was air-cooled (no radiator). More recently, the company made the New Beetle, which looked similar, followed by the present-day Beetle from 2012. These are completely different cars however, since they have a water-cooled engine in the front, and are very similar underneath to the Volkswagen Golf. There are many Volkswagen clubs around the world, the members restore or modify the original air-cooled Volkswagens. Disney made a series of films about a Beetle called Herbie. ↑ New York Times. "How to Spell Best-Seller". Chicago Tribune. Retrieved 11 March 2013. This page was last changed on 1 December 2018, at 14:29.